Dr. Grande is an Intern, St. John's Mercy Medical Center, St. Louis, MO. At the time this article was written, he was a medical student at the University of Pennsylvania. Dr. Stavropoulos is an Assistant Professor of Radiology, Division of Interventional Radiology, Department of Radiology, Hospital of the University of Pennsylvania, Philadelphia, PA. Permanent vena cava filters have proved to be safe to deploy and efficacious in preventing pulmonary embolization. 7 However, there are risks to patients who receive a vena cava filter. Complications may occur during vascular access, during filter deployment, and in the weeks, months, and years after filter deployment. Long-term risks of vena cava filters include increased risk of DVT, caval thrombosis, caval perforation, and guidewire entrapment during further vascular manipulation. 5,8,9 The risk of thromboembolic disease often decreases with time after an initial occurrence or a predisposing event, such as a traumatic injury, while the cumulative long-term complication rates associated with IVC filters may increase with filter dwell time. 10,11 Thus, in order to minimize the incidence of long-term filter-related complications, it may be desirable to retrieve vena cava filters from selected patients once their risk of thromboembolic disease has decreased. The recent introduction of nonpermanent IVC filters has made such removal possible. Nonpermanent IVC filters include temporary and retrievable filters. Temporary filters are deployed in the vena cava, yet they remain tethered by an external wire or catheter for ease of removal. Temporary filters require retrieval within a designated time frame, which is specific to each device. This mandatory retrieval requirement and an increased risk of infection are limitations of temporary IVC filters. If the patient continues to require caval interruption or has a significant clot trapped in the filter at the dwell-time limit, a permanent filter may need to be placed. No temporary filter is currently approved for use in the United States. 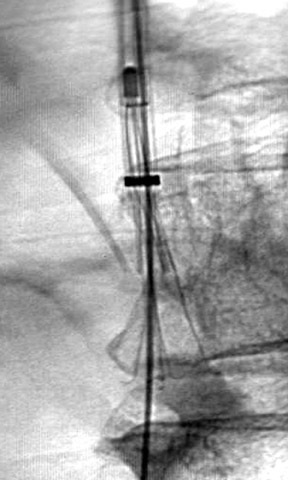 Retrievable IVC filters are placed in the same manner as permanent filters but can be retrieved percutaneously from patients who no longer require caval filtration. The period of time after implantation in which the filter may be safely retrieved from a patient is referred to as the window of retrievability. Currently, retrievable filter manufacturers provide a guideline as to the window of retrievability of each device. The Food and Drug Administration (FDA) approved these filters without a time frame given for removal. The timing of retrieval is generally up to each physician. Should a patient require continued caval filtration beyond the window of retrievability, the retrievable filter may be left in place as a permanent filter. 5,12-14 This article focuses on currently available retrievable filters as well as indications for their placement and retrieval. There are currently 2 retrievable IVC filters available for use in the United States: The Optease Retrievable Vena Cava Filter (Cordis Endovascular, Johnson & Johnson, Warren, NJ) and the Günther Tulip Vena Cava Filter (Cook, Bloomington, IN). Both devices are FDA-approved as both retrievable and permanent filters. The Recovery IVC Filter (Bard Peripheral Vascular, Inc., Tempe, AZ) was FDA-approved as a retrievable filter but has been recently removed from the market. It has been replaced with the G2 filter (Bard). The G2 is a modified retrievable filter that is currently FDA-approved as a permanent filter, but is undergoing a multicenter trial to assess the retrievability of the filter. An ideal IVC filter should be easy to deploy, should possess high filtration efficiency, and should have a high mechanical stability; it should also be biocompatible, nonthrombogenic, nonferromagnetic, and nonocclusive. 5,15 For retrievable IVC filters, additional desirable characteristics include easy retrievability from both jugular and femoral approaches and a long window of retrievability. 16 While none of the 3 available retrieval IVC filters meets all of these criteria at this time, each has unique characteristics that make it suitable for specific clinical situations. The Optease retrievable filter is constructed of 6 nitinol struts, which all converge at a point at the cranial and caudal ends of the filter to form a double-basket shape. The cranial end of each of the 6 struts is barbed to prevent cranial migration of the filter. The caudal apex of the filter is formed into a T-shaped retrieval hook to facilitate retrieval with a snare device. Insertion of the device is possible from both a jugular and femoral approach through a 6F introducer system, and the filter can accommodate caval diameters of up to 30 mm. Retrieval can be accomplished with any commercially available endovascular snare inserted through a 7F to 2F sheath via a femoral approach. The snare is used to engage the caudal retrieval hook, and the sheath is then advanced over the filter. The filter subsequently collapses and is withdrawn through the sheath. A recently published case series by Rosenthal et al 17 reported bedside intra-vascular ultrasound-guided insertion of the Optease filter into 94 intensive-care patients. Of the 94 patients, 31 (33%) had their filters removed after a mean of 19 days (range 5 to 25 days) following implantation. The authors reported no difficult or failed retrievals. The Günther Tulip Filter is a half-basket filter made of Elgiloy (Elgiloy Corp, Elgin, IL). The filter consists of four 0.45-mm legs connected to 4 tulip-shaped 0.2-mm wires that come together at the cranial apex (Figure 1). Hooks at the caudal end of each leg anchor the device to the caval wall; attached to the cranial apex is a rounded tip hook, which facilitates snare retrieval. Insertion through an 8.5F introducer sheath may be accomplished through either a jugular or femoral approach, and the Günther Tulip Filter is recommended for use in patients with a caval size of 30 mm or less. 18 A proprietary Günther retrieval kit or any commercially available endovascular snare can be used to retrieve the filter via the internal jugular vein. The proprietary retrieval kit consists of a 6F endovascular snare inserted through 2 coaxial sheaths, the larger of which has a 13F diameter. The apical filter hook is engaged with an endovascular snare, the inner sheath is used to collapse the filter, and the snared filter and inner sheath are withdrawn through the outer sheath. Initial data on the Günther Tulip Filter were reported following retrieval within 14 19,20 De Gregorio et al 21 have demonstrated that it is possible to extend the window of retrievability by repositioning the Günther filter within the vena cava every 14 days to prevent neointimal hyperplasia from fixing the filter in place. According to Terharr and colleagues, 22 the Günther filter may be recovered after longer periods of implantation, even without repositioning. They reported on the retrieval of 16 filters from 53 patients after a mean of 34 days (range 7 to 126 days) with no intervening repositioning. Only 1 filter (dwell time 55 days) was unable to be retrieved from a patient because of adherence to the vena cava wall. 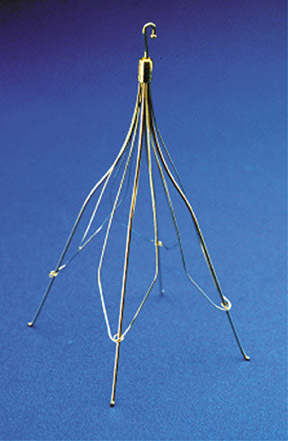 The Recovery filter is a bilevel filter composed of 6 arm and 6 legs with flexible hooks, all of which meet at a common apex at the cranial end of the filter. The wire elements are 0.014 inches in diameter and are composed of nitinol. Bard recommends that the Recovery filter be used in patients with a caval size <28 mm. This filter is inserted via a femoral approach through a 7F introducer sheath. Retrieval is accomplished with a designated re-trieval system (Recovery Cone Removal System, Bard). From an internal jugular approach, the retrieval cone is inserted through a 10F sheath. The cone is aligned over the filter apex, and the cone is collapsed over the apex by advancing the sheath. Once the cone engages the filter, it is withdrawn into the sheath (Figure 2). In a study by Asch, 16 Recovery filters were placed in 32 patients, with successful retrieval of 24 filters after a mean implantation time of 53 days (range 5 to 134 days). All attempts to retrieve a filter from patients in this study were successful. 16 At the author's institution, a Recovery filter was retrieved, without incident, 419 days after implantation. The physician placing an IVC filter must remain an active participant in the care of a patient with a retrievable filter during the period of implantation. The burden falls on this physician to remind the patient and referring physicians of the retrievability of the filter within a relevant time frame, and to assist in identifying patients in whom retrieval would be appropriate. The practice at our institution has been to remind the patient of the retrievable nature of the filter via letters at the time of insertion, at 3 months, and again at 6 months. We also maintain a patient database and periodically contact the referring physicians regarding possible IVC filter removal. There are no generally accepted guidelines regarding the optimal timing for retrieval of vena cava filters. Patients with documented evidence of PE or DVT should be therapeutically anticoagulated before the filter is retrieved. Anticoagulation does not need to be withheld during the retrieval procedure, though patients whose International Normalized Ratio (INR) is supratherapeutic may need to have their procedure delayed until it returns to within the desired range. 12 Patients who received a filter for prophylactic indications but who are no longer at increased risk for thromboembolic disease may undergo filter retrieval without anticoagulation, after the absence of lower-extremity DVT has been documented. The appropriate workup prior to filter retrieval is also largely based on institutional guidelines. At our institution, patients are first assessed for suitability for filter retrieval in the interventional radiology clinic. If retrieval is deemed appropriate by the radiologist and referring physician, the patient is screened for lower-extremity thrombus with either computed tomographic venography or duplex ultrasonography. Preretrieval laboratory work includes a complete blood count, INR, and serum creatinine. Preretrieval cavography is performed by passing a flush catheter distal to the filter to assess for clot burden and determine the position of the filter. A cavagram is repeated after filter retrieval to assess for caval trauma or residual thrombus. The presence of thrombus within the filter may complicate filter retrieval. Thrombus within the filter is evidence of thromboembolic disease and, thus, may necessitate therapeutic anticoagulation if the filter is removed. The generally accepted practice has been to retrieve a filter if there is a small amount of thrombus in the filter. Filters with a large amount of thrombus are generally left in place. The patient may continue on anticoagulation in anticipation of future filter removal. If filter retrieval in such a patient is more urgent because of an expiring window of retrievability, pharmacologic or mechanical thrombolysis may be used to remove the clot. There is a lack of evidence regarding the amount of thrombus that is safe to remove within a filter, and the determination of what constitutes a large or small thrombus burden has been left to the judgment of the radiologist attempting to retrieve the filter. While anticoagulation remains the standard therapy for patients with DVT or PE, IVC filters have gained acceptance as protective measures against the complications of venous thromboembolic disease for patients who cannot be anti-coagulated. Retrievable vena cava filters, in particular, are useful for patients who are at increased risk for or who have documented venous thromboembolic disease but who also have temporary contraindications to anticoagulation. The above recommendations represent the best current practice guidelines, but unfortunately, few of these recommendations derive from empirical clinical data. The safety of retrievable vena cava filter deployment and retrieval has been demonstrated by numerous studies, but there is a paucity of evidence regarding the long-term safety or efficacy of these devices. More data needs to be gathered regarding retrievable filters that are subsequently used as permanent filters, especially with regard to complications, such as caval thrombosis and filter migration. It also remains to be proven that the long-term complications of vena cava filters are lower in patients in whom a retrievable filter was placed and subsequently removed than in patients in whom the filter is left in place as a permanent filter. In addition to research regarding the safety of retrievable filters, attempts to more accurately determine the window of retrievability of each filter type in humans is needed. Extension of this window could lead to an increase in the fraction of filters that are retrieved from patients and could reduce the number of procedures, such as filter repositioning, which are used to extend this window. Retrievable inferior vena cava filters. Appl Radiol.